Pause and Celebrate Life Today! This post is a little different. Today my husband and I celebrate our 9 year wedding anniversary. I still have my wedding planner, and as I browse through it, it makes me laugh. I was so concerned about the band, the food, appointments to keep with various vendors, and everything else. I was looking through wedding photos, and I came across this one. 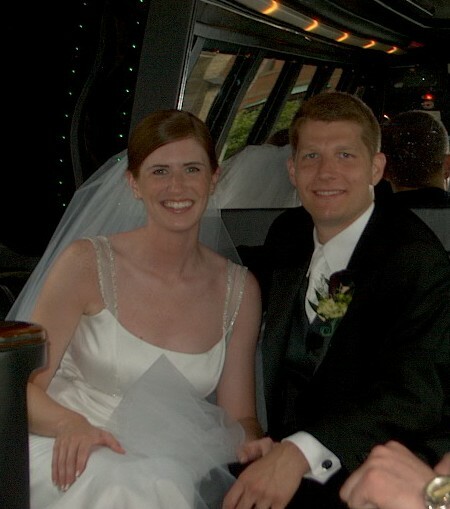 This is after the church ceremony was over, and we were in a super fun limo bus with a few friends and a couple of family members. There are a lot of great memories from that day, but I will admit this was the best moment. All the worrying was over and I was so happy to be married to this wonderful man. O.K., I know. Cheesy. But it made me think about all of the times I worry about things, and those things pass. What I’m left with are great memories, and I’m so excited for future adventures. I’m so thankful to have so many great friends and a loving family. So on this day, I don’t want to think about reviewing a restaurant meal or writing about what I made for dinner. I want to pause for a moment and thank everyone I know for making my life what it is – wonderful. Happy Anniversary. I bid you any more great memories and fun times together. You two are the best…9 years of laughter and love with so much more to come, have a perfect anniversary together. Happy Anniversary! Wishing you two a wonderful day! We’ll have a special anniversary cheers in our red dresses.